This week, there wasn’t much activity so I decided to walk around the mall and see what interesting gems I could find. I actually found quite a few! This place is stuck in time and totally feels like a ghost town. It seriously is like a zombie movie where everyone just drops everything and runs, leaving behind a snapshot of how life was before the population was eaten alive. Walking around the mall you see all kinds of items that are either broken, dirty or just left abandoned in random places. First example is the escalators. They don’t escalate. They don’t move. They just sit. As if after all these years of moving up and down, they are simply tired and giving a big middle finger to all the mall walkers who dared to climb on for a free ride. Pish posh! You will climb up and down you lazy bums! Then there are the carts/strollers. 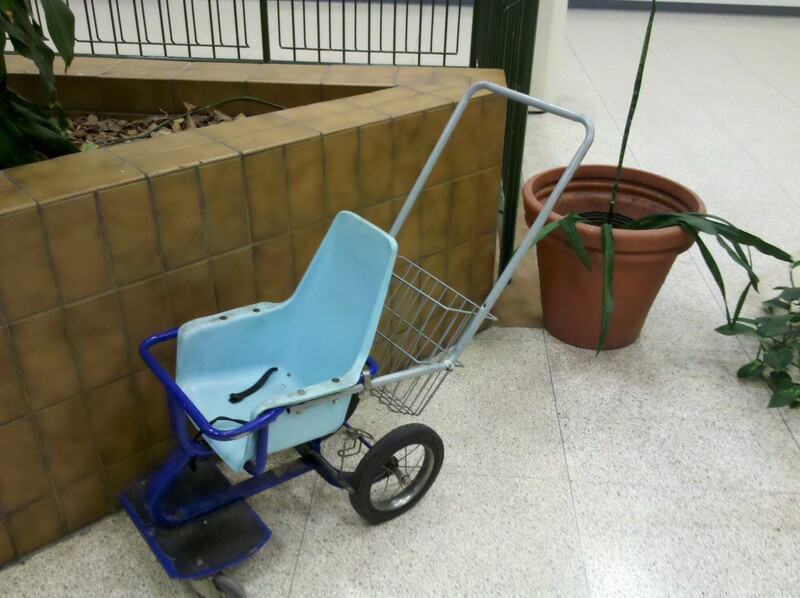 You’ll be walking and come around the corner and see a cart there. Or is it a stroller? Or is it both? I can’t tell. It might also be some kind of prehistoric wheelchair for all I know. It is a nice pretty robin’s egg blue though. Also, notice the healthy, full plant directly behind said cart/stroller. Sad isn’t it? That plant is a direct reflection on the state of the mall itself. 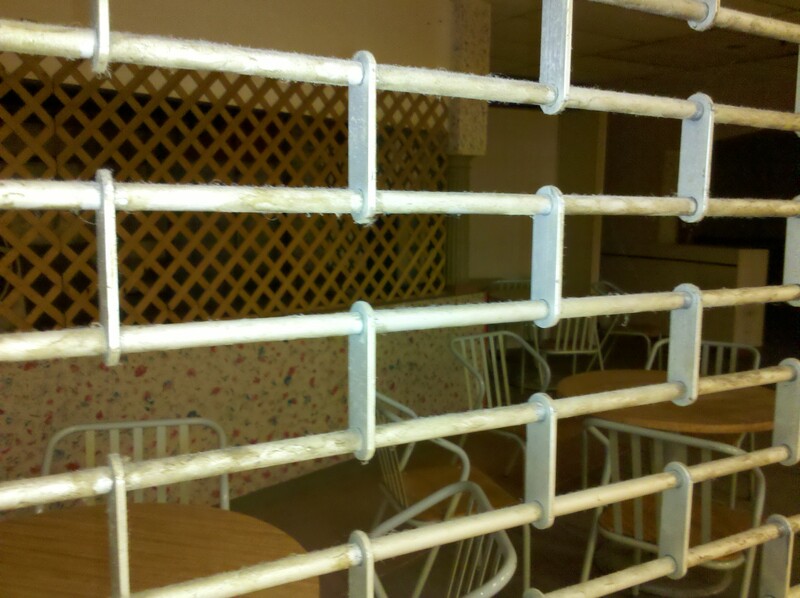 Then there are the abandoned shops. Most of the bays here are empty and closed up and they don’t have windows to see in, or else the windows have been boarded up. However, there are a few that you can see in to and it’s totally worth the peek! First there is the chair graveyard. 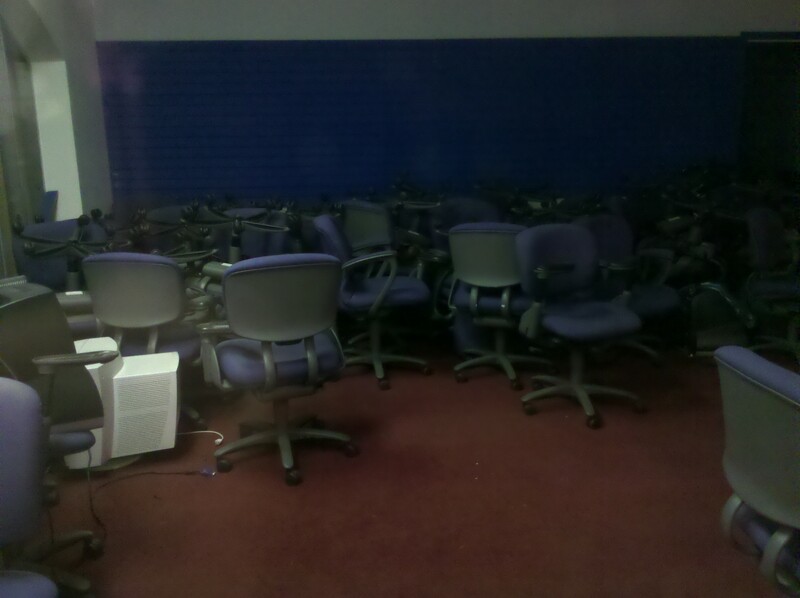 Not sure what this store used to be but it’s now the dumping ground for old blue office chairs. It’s actually kind of eerie to look in and see all these chairs piled up on each other. 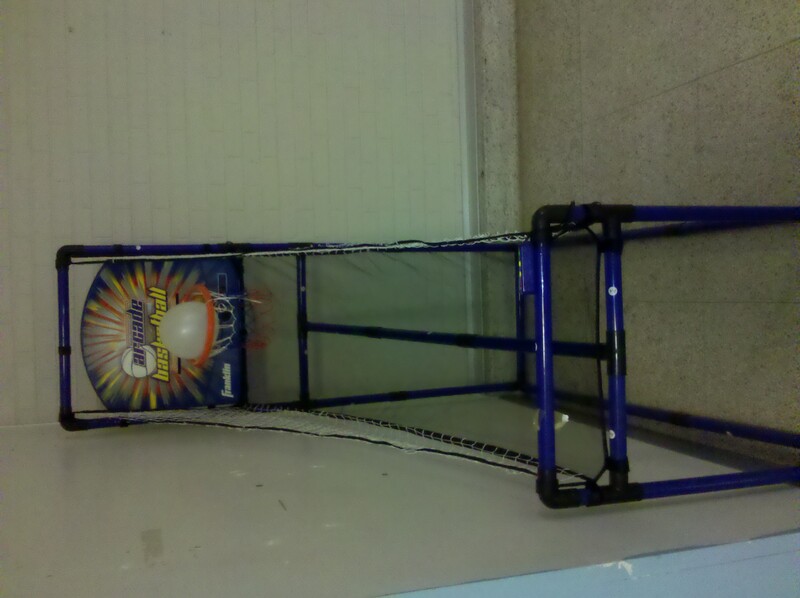 On the other hand, it might be fun to break in and have chair races up and down the halls of the mall! Next comes the old JC Penney Decorating and Design Shop. It seems that not only did JCP have one of the big anchors in the mall, they also had a design outlet. 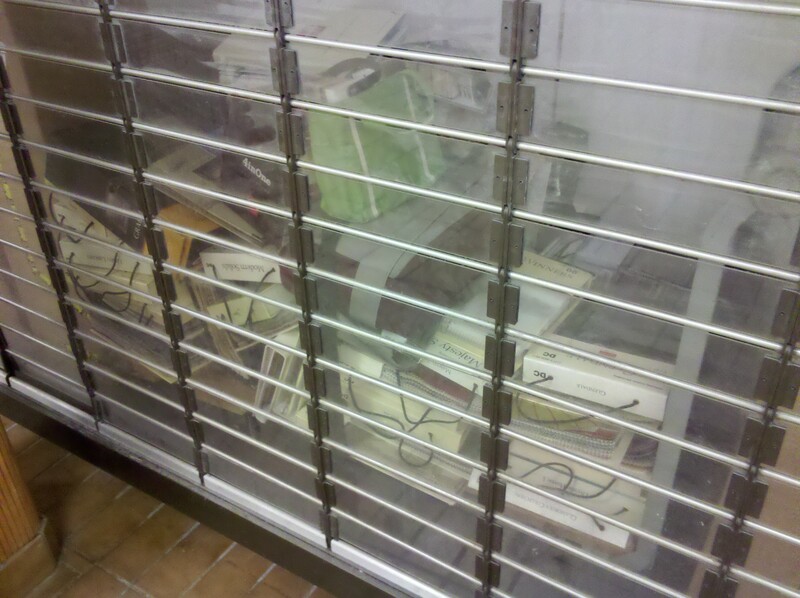 You can see here the stacks of swatches piled up by the gate. They actually still have signs up at other spots in the mall, directing people to come down to the shop and get 20% off! Sweet! I’ve always wanted to buy my very own swatch book and now I can get one at a discount! I just have to figure out how to break down the gate and get in there…. Next comes a restaurant that was apparently abandoned in the 80’s because the walls have that awesome sponge painting on them. And it’s even done in turquoise and fuscia. FABULOUS (jazz hands)! 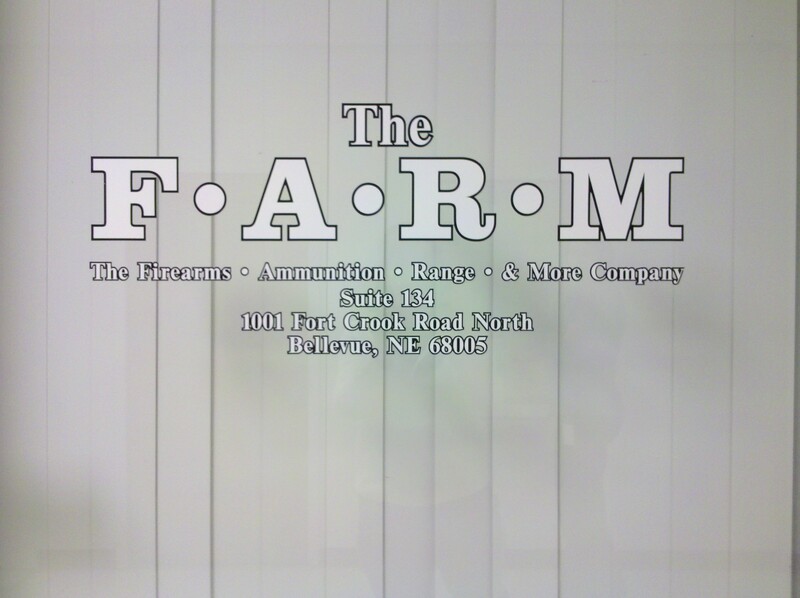 Maybe these owners could have used some help from the JC Penney Decorating store. Guess they didn’t know they could get 20% off. Anywho. This one really looks like everyone in it just vanished into a puff of smoke. All the tables/chairs are still set up and the counter looks ready to serve (aside from the inches of dust on it). I think the trellis is a nice touch too. Oddly enough, there is no shortage of places to buy candy around here. 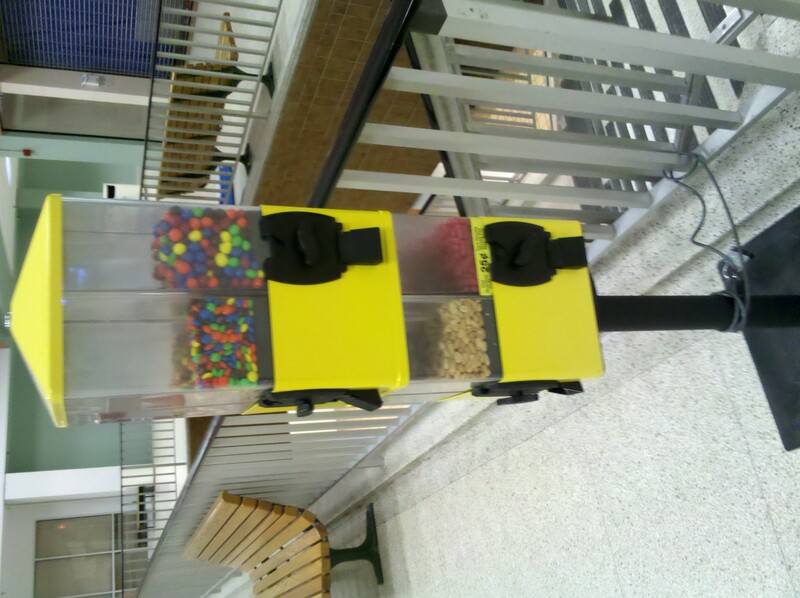 There is the GIANT gumball machine, the candy cart and then the regular old collection of candy machines. 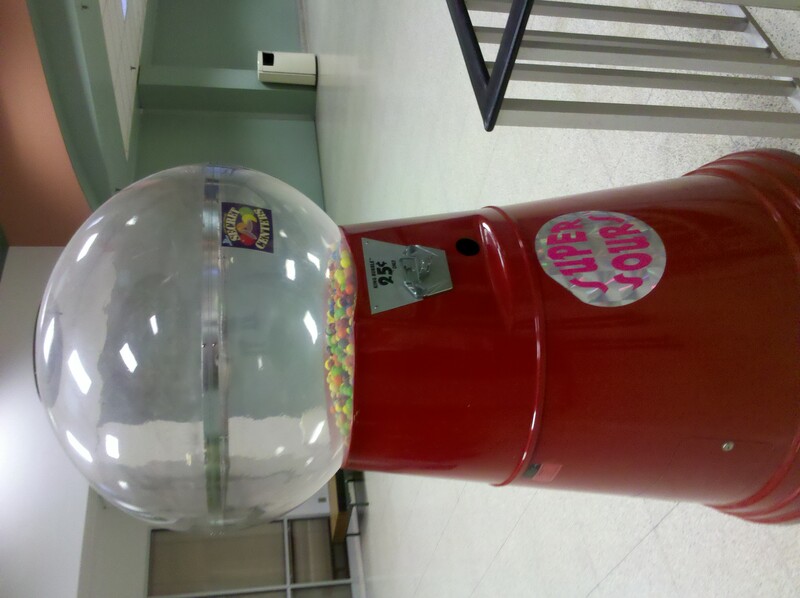 The giant gumball machine is nearly empty so the gumballs (with their “Secret Centers”) must be popular. Or else that machine has been around since the mall opened 44 years ago and it’s taken that long to empty it. At any rate, I’m not sure how old those balls are but they’ve gotta be pretty old. And who wants old balls? I mean, really. Same holds true for this guy. Again, I imagine these candies haven’t been refilled or refreshed in quite some time. Wonder if there is a little expiration date on each one? Some day I will double dog dare one of the Indians into trying one of them. I’ll tell them it’s an American custom or something. 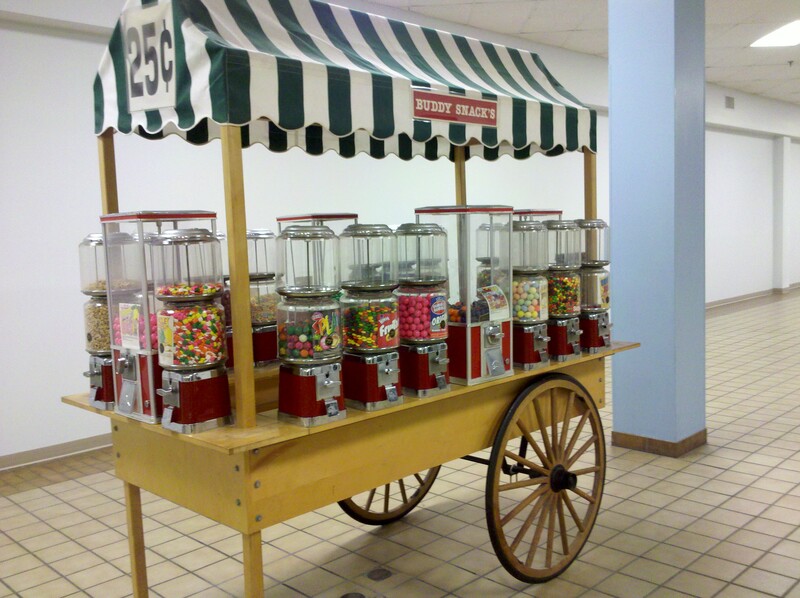 Candy cart – see comments above. Ditto and ditto. I like the name of it though – Buddy Snacks. That’s very friendly don’t you think? I can see it now….Feeling lonely? In need of a friend? Come on down and get a Buddy Snack! We’ve got all the candy you could possibly want! Never mind that it’s 25 years old and may turn your stomach inside out. For a moment, it’ll make you feel loved and less alone! I tell ya, they think of everything in this mall. Not only do they have a gazillion candy machines, they also have several scales so that you can see exactly how many pounds you gained stuffing your face (or how many pounds you lost after the candy made you puke). This one is for the person that wants everything. 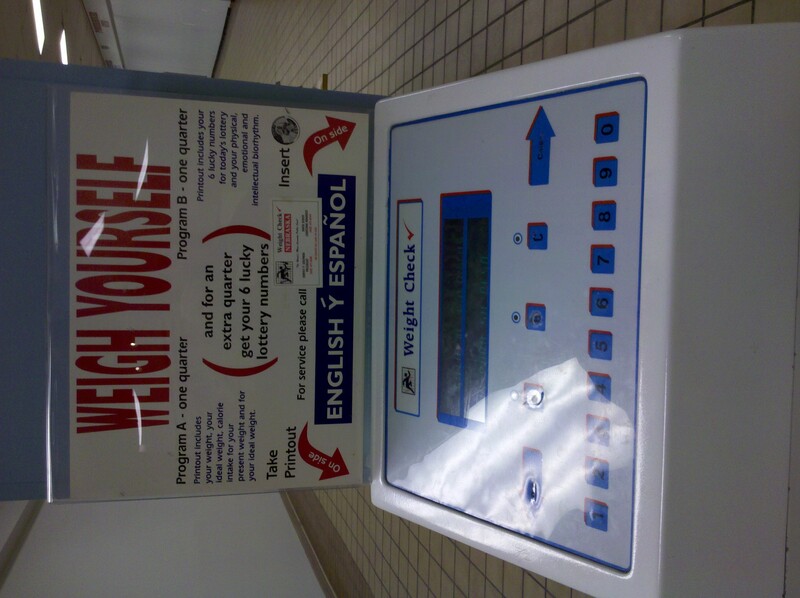 It not only gives you a report of your weight, your ideal weight, and calorie in take, but it also gives you your 6 lucky lottery numbers AND speaks Spanish. You guys, this is frickin’ sweet! All that for only a quarter! You can’t beat it! This next one is my favorite. 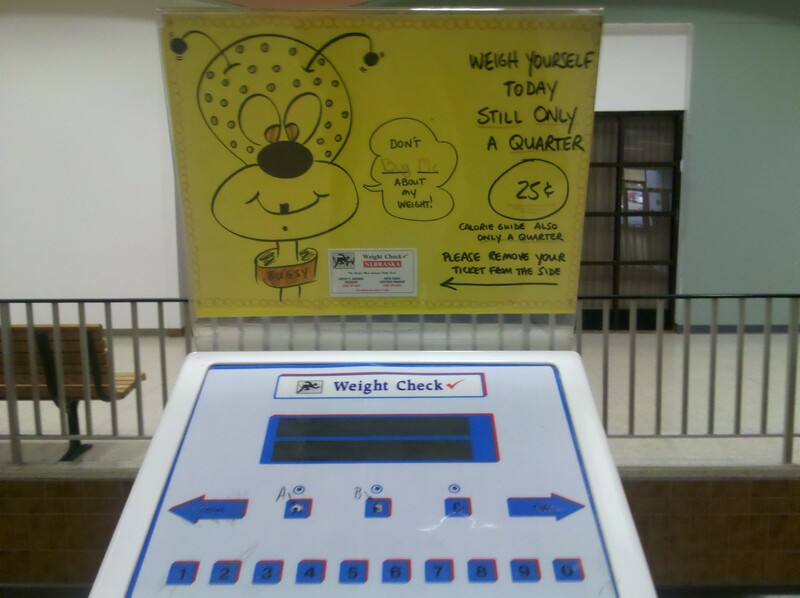 It has a handmade sign, with a picture of a bug on it saying “Don’t bug me about my weight!” The bug is even wearing a collar that says “Bugsy”. HA! Love it! And guess what? It’s still only a quarter! You can’t beat that folks! I don’t think this one speaks Spanish though or gives me my lucky lottery numbers but that’s ok. Bugsy makes it all worth it. Last but not least, we have the other random stuff that can’t be categorized. Here is a window we found that was boarded up with newspaper. Notice the date on the newspaper – June 24, 2001. That’s 10 years ago! 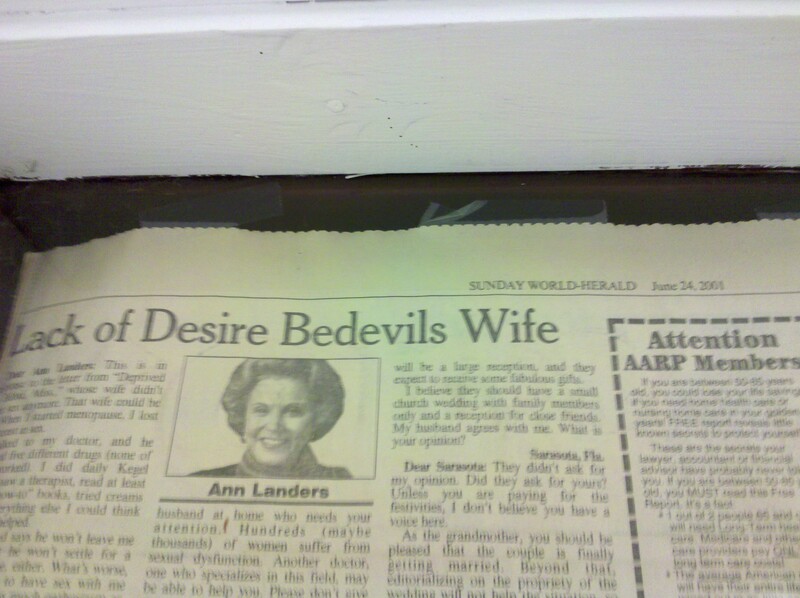 I also like the Ann Landers headline – “Lack of Desire Bedevils Wife”. Tell me more Ann!! Last but not least, we have the mirror framed bay. This bay has actually been turned in to a conference room for our office and the doors are surrounded on all 3 sides by mirrors. 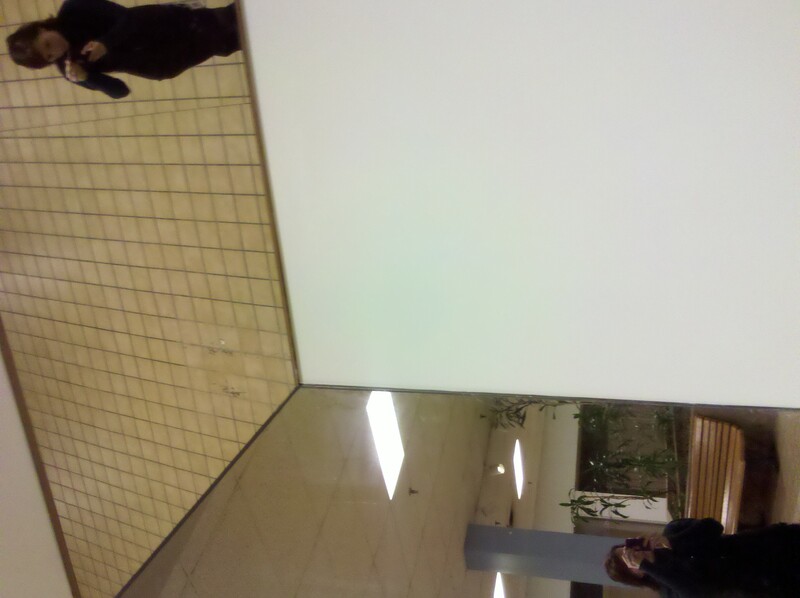 Look – there are 2 of me! I don’t appreciate how hippy the top image makes me look though. I’m going to go console myself by getting some candy from Buddy Snacks. Well, that’s it for this week. Stay tuned and as always, you’ve been Annexed! P.S. On Friday you can find me outside The Mall at 3 a.m. waiting for the doors to open. Gonna get me some good deals! Oh wait, this mall doesn’t have any stores. Ok never mind.